Well I’ve listened long enough: listened to clichés, listened to assertions, promises, excuses, personal and collective criticisms and outright blame. Yet I have always believed that people deserve a fair hearing. Just because their point of view is different from mine (or that of the majority) does not mean it should be ignored. But how long does a fair hearing last? And at what point do you give up? Wherever that point is for you, I have reached it. Those with a more analytical mind will no doubt be able to list the numbers accurately, but to me there have been just too many contradictions. Whether it be about transfers, managers, ambition, individual players, personal achievements and plans, whatever has been said by the club under this ownership lacks any consistency and therefore, any credibility. And then there are the silences. Whether there are legal implications or whether sheer lack of the principle of honesty is to blame, things we supporters feel we ought to be told have been covered up in a manner that would make a politician seem trustworthy. Personally, I don’t believe anyone who speaks – or doesn’t – for the club any more. In the world of business we supporters (customers ) have almost no say in the way that a business is run. We have few rights and being told the truth is not one of them. Take it or leave it…”You know where the door is.” Indeed I do. I have been coming through that door in its various forms for half my lifetime and whatever our fortunes inside, it has never occurred to me not to come in… until now. Listening to or reading the views of others, I know I am not alone. Comments on a range of media have ranged from the clearly articulated (as is the case with this site) to the downright obscene (no names) but the message is the same – we were asked to “believe” but expected never to question those who “know football” regardless of our own depth of knowledge. No. As fans, we were promised we had been listened to, that lessons had been learned yet we were, once again, falsely informed. With such a track record of misinformation and disinformation, is there any wonder that I and many others no longer “believe”. But none of this is new. While the new-found frankness of local journalists and commentators is to be applauded, they too have no control over what is going on, their words, like mine, will not change the situation. Yes I can stay away, I can write out my feelings to add to all those of others, but ultimately it is all pointless. I can change nothing. There has to be one. Underneath all the vitriol and “crap” there has to be something to temper my pessimism… and I think I may have found it: Time. Anyone with anything of a long-standing relationship with this club knows about the dark days, the threats to our very existence that we have faced. 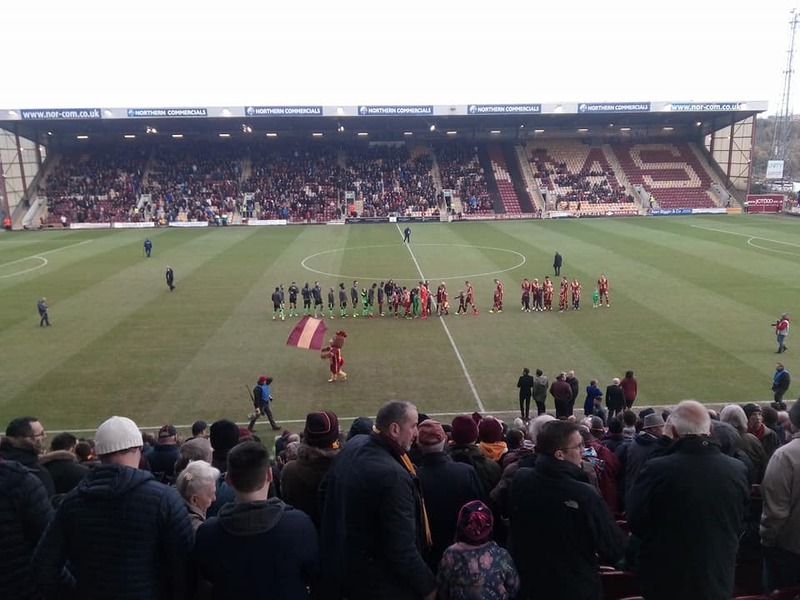 But equally, those same people will know of the resurgences, the triumphs that make up the intangible soul of Bradford City and that has kept it going and kept us coming. Maybe we have to accept that which we, as supporters, cannot change but, if so, do so with the confidence that “Time” and the cycle of fortune will bring about the things we seek. It is not a pleasant thought – particularly to one about to enter his seventieth year – but there will be change for the better in time. So if you believe as I do that “Time” will heal the difficulties then the accompanying requirement has to be “Patience” – and that is something that is often in short supply with many fans. Sadly such pessimistic optimism is the reality I feel we are faced with. What shall we do? We do nothing. But if it makes you feel better, add your protest while you wait. P.S. Those who may recognise the lyrics at the start may associate them with Rod Stewart or some of the others who have covered this song. In fact it was written and originally recorded by Tim Hardin in 1967.
nah, TIME is UP – we need him OUT!! NOW!!!! RAHIC PLEASE DO ONE !!! Well written piece. However, time is up. Rahic out. Excellent article which suns up very clearly the thoughts of most fans who have supported this OUR club for many many years. Sorry Ron you are wrong and I completely agree with Simon above. Your view seems to be that people cannot change or influence anything and we should just accept our fate until things come to pass. Well tell that to the USA civil rights movement back in the 60’s, Ghandi, Martin Luther King Jnr, Nelson Mandela, the people who brought down the Berlin Wall and the shipyard workers in Gdansk to name just a few from the top of my head. Also, what about our elderly fans who may not be around when Rahic decides in 3, 5 or 20 years time that he’s had enough of this ‘train set’ and wants to move onto a different toy? Fans can instigate change and a boycott of VP however unpalatable is one way to get the message. Support City away but let Rahic get the message at VP by our absence. Let him know that we do not tacitly accept his stewardship of our club and that is what it is stewardship of our club and not ownership. He he has single handedly managed to destroy everything good about our club in less than two years. It seems many lifetimes ago he was handing out free burgers at that away game. Even though I’m now across the pond I manage to get home for around 15 to 20 matches a season (home and away) and have always renewed my season ticket, as that was one way I could support the club from afar. Latterly, on top of my season ticket I’ve also pay for iFollow, which is another £140. I doubt if i’ll be doing either next season if these two clowns are in charge and I’m boycotting VP until they have gone. I will now plan my visits home for away matches rather than who we’re playing at VP. You only have to read the email posted on twitter by Glenn Ackroyd, who pays £4k a year to be a club ambassador, to Rahic back in June to which Glenn did not get a repl. This aptly sums up how far down we have spiralled under this man’s megalomaniac leadership. Sacking Wendy and then promoting a bar staff member as club liaison person? WTF! Nepotism at its finest. Employing the Mrs, no previous experience, into one of the most important roles at a football club – the Club Secretary? I would say that the Daily Star article is a damming indictment of what’s happened under Rahic. ‘Never has a person made a bigger mistake when they did nothing because they thought they could only do so little’. Had it to the top with the owners now. Still not collected my ST and, alongside my 2 junior children, am unlikely to renew. My connection with the club seems evermore disconnected which is sad after 35 years of regular support. It’s very sad. Been going since 1968 and ST holder for as long as I can remember. Not been to a game since around Stuart’s sacking, or at all this season. I just can’t be bothered really, and it pains me to see Rahic (Rupp cannot be totally absolved from this mess), destroy everything I love about my club. My god, I’ve seen some rubbish in over 50 years, but I kept going back. This is something so different. The current owners have destroyed all momentum we had; setting us back years, and have alienated so many fans and created so many divisions between the staff and fans that nobody likes or wants them. The place really is toxic. The sooner he goes the better, (but his arrogance will probably see him stay a lot longer than any of us want). If “you know football” , do one for all of our sakes, because you know what, you don’t, and this mess just proves it. Thanks to Canadian bantam for reminding me of the importance of protest in a wider context – I have both participated in and observed many in my lifetime. My context was a football one and, sad to say,the success of fans’ protests whether collective or individual has been very limited. Whether you turn your back on your team or fly a banner from an aircraft seems to have little effect -just ask those at Newcastle,Blackpool and, especially Wimbledon. Whatever success is achieved is often due to business rather than fans’ input. As I say, protest by all means but be prepared to have to wait for results. I apologise if I took your comment out of context, I meant no offence. It just appears that we disagree as I feel football protests are very important. Even if they achieve very little in terms of outcome they do remind the powers-that-be that they have constituents whom should be considered and even answered too. Bigger clubs quite often do not rely on season ticket or match day sales to finance their club but smaller ones like ours do. Any boycott of match day ticket sales at VP whether by home fans or visiting fans will have an impact on Rahic’s bottom line. Maybe when this is hit hard enough it will give him food for thought as right now it seems to me that he feels that he has done nothing wrong and is without blame for our current situation. Also, I feel football protests can focus national media attention on a club which brings it under further scrutiny which might help find answers to some unanswered questions we’re all asking and / or help give confidence to someone in the know to speak out and tell us what has really been happening. Finally, I would say that protesting stops us from being passive and being ‘victims’ and helps us empower ourselves to shape the future of the club, which means the world to us and which we all love so much. Yes, we can all make a difference. Again to paraphrase….. “You be the change you want to see in the world”. The good news, without new investment by Rupp we are likely nearer the end rather than the beginning of their disastrous ownership. Maybe this song should be used when the teams come out!! You think we can’t change anything. We’re being left on the debris. So City, incidentally, let’s keep attracting the crowds but bid farewell to the (not city) gents up in their penthouse. Ooh la la Mark. I’ve had me a real good time at VP over the years, but now It’s hard to believe that this is the place where we were so happy all our lives. The talk of Rahic out is all well and good but who comes in? Protests, walk outs and non-renewals are fine and could eventually make him sell. Problem is, he won’t give a monkeys who he sells it to. Custodianship is a meaningless word to him and Rupp. Our end game surely has to be working with interested parties and supporters to work on a plan to get a consortium together to buy the club. That way it falls into the right hands and we don’t end up in another situation like this. Verbal protests against Rahic at matches will have no effect because he’ll stop attending like he did when McCall was sacked. I still contend empty seats are the answer. Those pictures of near deserted home sections at Blackpool last weekend spoke volumes. Even if they have no effect on Rahic, imagine what Rupp will think when he gets wind of it? That lack of support, translated into unsold season tickets next season, will knock the dividend on his investment for six. The thought of making money is the only thing that motivates these two. I wonder how much Rahic is paying his missus? Probably more than a lot of the players earn. Sanctions brought North Korea into line. Time to starve the club of cash and drive these two OUT! I’m afraid you are right . I’ve said all along if you cut the finances… Rupp and Rahic will have no where to go but sell . I agree with your view Ron. How many years have Charlton, Blackpool, Blackburn and Cardiff fans been trying to remove their owners? How many years could it take to remove R&R? What have those fans of the above-named Clubs actually achieved? What do Cardiff fans NOW think about Vincent Tan? And finally, how are those Teams of the Clubs named above performing in respect of, and relative to, the Claims of their supporters that the owners were going to ‘destroy’ their Football Clubs? The only reason the Oystons are now agreeing to give up ownership of Blackpool is because of the £34 million debt they have been ordered by the Court to pay Valeri Belokon and NOT because of the years of abstinence practiced by the Blackpool fans. Firstly to give some context I have been going to City since 1965. Those that know me will agree, I hope, that I have worked hard for a club I love during the last 30 plus years. Twice as Chairman of the old Supporters Club, founder of the Supporters Trust, and Friends of Bradford City and a long association with City Gent magazine. Together with my late wife Julie, I think I/we have done our bit. I don’t want any thanks for that, as it was my choice, but done because of a passion and a love for Bradford City. This summer I deliberated whether to renew my season ticket for the first time ever. I feel a massive disconnect with the club, hate certain aspects of the way the club is being run and also don’t ‘believe’ that the current strategy ( vague as it seems to be)will ever work. I knew about the way SM was being treat way before he was sacked as I spoke to him about it. I knew certain members of staff had left, and the reasons for their departure. I knew certain aspects of what had gone on with Luke Hendrix and Tony McMahon. Now a lot of this has been confirmed in both the local and national media and at last the impact of Rahic leadership is being revealed for what it is. Eventually I did renew my season ticket mainly to retain my seat which is alongside family and friends who I love to see n matchdays. Now I believe we have to rid ourselves of Rahic (and maybe also Rupp). How we do that I really do not know. If we do not then the very existence of our beloved club is at risk. I really do believe firmly that is true! So do we not attend home games, or do we attend but give a visual sign (linked scarves) to Rahic that we are not happy. He seems oblivious or uncaring that 4k customers (fans) did not renew this summer and I believe if we do not act then even more will not renew next summer and bring about a financial meltdown of our club. Bradford City may not exist anymore. We acted in 2002 and saved the club. We have done it before that. I remember crisis meetings at St George’s Hall and in the Ill fated main stand one Sunday morning. I don’t know what we do, but I do know we ALL need to sing from the same hymn sheet and show a collective demonstration to Rahic and Rupp and we need to do it soon.